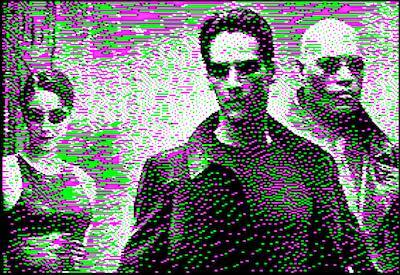 Re-engineered Matr][x-Demo fragment of the late French Touch demo group. It is hard to imagine how the demo should have looked like from the view of the original authors. I took most of the graphic & sound material of the theme available and combined it by implementing a small state machine for controlling the single short sequences of the demo. The original fragment only had the three effects in a row with no sync to the music yet. I found out the that the music file contained a timeline track which was, however, set to "0" at every time step so there was no chance to sync the graphics to the music. With a bit of HEX-editing and debugging the original timeline-evaluation function I can now trigger the state machine when the song reaches certain trigger points. This said: since the triggering is done using the 6522 interrupt of the mockingboard, the demo won't run if you do not have one installed! Sorry for that, have you configured AppleWin as an enhanced Apple //e? There are some 65C02 instructions inside the code which might crash on a 6502 CPU? Using Virtual II configured as enhanced Apple //e works fine. Second, the Mockingboard emulation must be implemented correctly in the emulator. If you have no correctly implemented Mockingboard the demo might crash on an emulator. page created in 0.014219 seconds with 15 queries.